"Mondale" redirects here. For other people, see Mondale (surname). 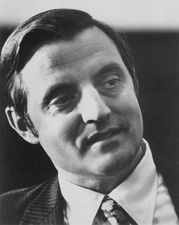 Walter Frederick "Fritz" Mondale (born January 5, 1928) is an American politician, diplomat and lawyer who served as the 42nd Vice President of United States from 1977 to 1981. A United States senator from Minnesota (1964–1976), he was the Democratic Party's nominee in the United States presidential election of 1984, but lost to Ronald Reagan in an Electoral College landslide. Reagan won 49 states while Mondale carried his home state of Minnesota and District of Columbia. He became the oldest-living former U.S. vice president after the death of George H. W. Bush in 2018. Mondale was born in Ceylon, Minnesota, and graduated from the University of Minnesota in 1951 after attending Macalester College. He then served in the U.S. Army during the Korean War before earning a law degree in 1956. He married Joan Adams in 1955. Working as a lawyer in Minneapolis, Mondale was appointed to the position of attorney general in 1960 by Governor Orville Freeman and was elected to a full term as attorney general in 1962 with 60 percent of votes cast. He was appointed to the U.S. Senate by Governor Karl Rolvaag upon the resignation of Senator Hubert Humphrey following Humphrey's election as vice president in 1964. Mondale was subsequently elected to a full Senate term in 1966 and again in 1972, resigning that post in 1976 as he prepared to succeed to the vice presidency in 1977. While in the Senate, he supported consumer protection, fair housing, tax reform, and the desegregation of schools. Importantly, he served as a member of the Select Committee to Study Governmental Operations with Respect to Intelligence Activities ("Church Committee"). In 1976, Jimmy Carter, the Democratic presidential nominee, chose Mondale as his vice presidential running mate. The Carter/Mondale ticket defeated incumbent president Gerald Ford and his vice presidential running mate, Bob Dole in the first televised vice presidential debate. Carter and Mondale's time in office was marred by a worsening economy and, although both were renominated by the Democratic Party, they lost the 1980 election to Republicans Ronald Reagan and George H. W. Bush. In 1984, Mondale won the Democratic presidential nomination and campaigned for a nuclear freeze, the Equal Rights Amendment, an increase in taxes, and a reduction of U.S. public debt. His vice presidential nominee was Geraldine Ferraro, a Congresswoman from New York, who was the first female vice presidential nominee of any major party. Mondale and Ferraro lost the election to incumbent president Ronald Reagan, winning only Minnesota and the District of Columbia. After his defeat by Reagan, Mondale joined the Minnesota-based law firm of Dorsey & Whitney and the National Democratic Institute for International Affairs (1986–93). President Bill Clinton appointed Mondale United States Ambassador to Japan in 1993; he retired in 1996. In 2002, Mondale ran for his old Senate seat, agreeing to be the last-minute replacement for Democratic Senator Paul Wellstone, who had been killed in a plane crash during the final two weeks of his re-election campaign. However, Mondale narrowly lost that race to Saint Paul mayor Norm Coleman. He then returned to working at Dorsey & Whitney and remained active in the Democratic Party. Mondale later took up a part-time teaching position at the University of Minnesota's Hubert H. Humphrey School of Public Affairs. Mondale was born in Ceylon, Minnesota, the son of Claribel Hope (née Cowan), a part-time music teacher, and Theodore Sigvaard Mondale, a Methodist minister. Walter's half-brother Lester Mondale became a Unitarian minister. Mondale also has two brothers, Clarence, known as Pete (1926–2014) and William, known as Mort. His paternal grandparents were Norwegian immigrants, and his mother, the daughter of an immigrant from Ontario, was of Scottish and English descent. The surname "Mondale" comes from Mundal, a valley and town in the Fjærland region of Norway. Mondale attended public schools and Macalester College in St. Paul before transferring to the University of Minnesota, where he earned a B.A. in political science in 1951. As Mondale did not have enough money to attend law school, he enlisted in the U.S. Army and served for two years at Fort Knox during the Korean War, reaching the rank of corporal. He married Joan Adams in 1955. Through the support of the G.I. Bill, he graduated from the University of Minnesota Law School in 1956. While at law school, he served on the Minnesota Law Review and as a law clerk in the Minnesota Supreme Court under Justice Thomas F. Gallagher. He then practiced law in Minneapolis, and continued to do so for four years before entering the political arena. Mondale became involved in national politics in the 1940s. At the age of 20, he was visible in Minnesota politics by helping organize Hubert Humphrey's successful Senate campaign in 1948. Humphrey's campaign assigned Mondale to cover the staunchly Republican 2nd district. Mondale, who had been raised in the region, was able to win the district for Humphrey by a comfortable margin. In 1960, Governor Freeman appointed Mondale as Minnesota Attorney General following the resignation of Miles Lord. At the time he was appointed, Mondale was only 32 years old and had been practicing law for four years. He won re-election to the post in his own right in the 1962 election. During his tenure as Minnesota Attorney General, the case Gideon v. Wainwright (which ultimately established the right of defendants in state courts to have a lawyer) was being heard by the U.S. Supreme Court. When those opposed to the right to counsel organized a Friend of the Court brief representing several state attorneys general for that position, Mondale organized a countering Friend of the Court brief from many more state attorneys general, arguing that defendants must be allowed a lawyer. Mondale also continued the investigation of former Minneapolis mayor Marvin L. Kline and the mismanagement of the Sister Kenny Foundation. At the 1964 Democratic National Convention, Mondale played a major role in the proposed but ultimately unsuccessful compromise by which the national Democratic Party offered the Mississippi Freedom Democratic Party two at-large seats. Mondale also served as a member of the President's Consumer Advisory Council from 1960 to 1964. On December 30, 1964, Mondale was appointed by Minnesota Governor Karl Rolvaag to the United States Senate to fill the vacancy caused by Hubert Humphrey's resignation after being elected Vice President of the United States. Mondale was elected to the Senate for the first time in 1966, defeating Republican candidate Robert A. Forsythe, by 53.9 percent to 45.2. In 1972, Democratic presidential candidate George McGovern offered Mondale an opportunity to be his vice presidential running mate, which he declined. That year, Mondale won reelection to the Senate with over 57 percent of the vote, even as President Nixon carried Minnesota. He served in the 88th, 89th, 90th, 91st, 92nd, 93rd, and 94th congresses. Mondale worked hard to build up the center of the party on economic and social issues. Unlike his own father, a fervent liberal, he was not a crusader for the New Deal. Instead he realized the Democratic base (especially ethnic blue-collar workers) was gradually moving to the right and he worked to keep their support. Mondale showed little or no interest in foreign policy until about 1974, when he realized that some knowledge was necessary if he had loftier aspirations than the Senate. He developed a centrist position, avoiding alignment with either the party's hawks (such as Henry M. Jackson) or its doves (such as George McGovern). He took a liberal position on civil rights issues, which proved acceptable in Minnesota, a state with "a minuscule black population". Mondale was a chief sponsor of the federal Fair Housing Act, which prohibits discrimination in housing and created HUD's Office of Fair Housing and Equal Opportunity as the primary enforcer of the law. During the Johnson presidency, Mondale supported the Vietnam War, but after Richard Nixon became President in 1969, he began to oppose it and participated in legislation aimed at restricting Nixon's ability to prolong the war. Mondale is pro-choice on the issue of abortion. In 1967, Mondale served on the Aeronautical and Space Sciences Committee, then chaired by Clinton P. Anderson, when astronauts Virgil "Gus" Grissom, Ed White, and Roger Chaffee were killed in a fire on January 27 while testing the Apollo 204 (later renumbered Apollo 1) spacecraft. NASA Administrator James E. Webb secured the approval of President Lyndon B. Johnson for NASA to internally investigate the cause of the accident according to its established procedures, subject to Congressional oversight. NASA's procedure called for the Deputy Administrator (and de facto general manager), Dr. Robert C. Seamans, to appoint and oversee an investigative panel. In February, a reporter passed a leak to Mondale, of the existence of an internal NASA report issued in 1965 by Apollo program director Samuel C. Phillips, detailing management, cost, delivery, and quality problems of the Apollo prime contractor North American Aviation. In the February 27 hearing, Mondale asked Webb if he knew of such a report. Webb had not yet seen the December 1965 written report, so he responded in the negative. Seamans had passed along to Webb neither the written report, nor the briefing presentation made to him in January 1966 by Phillips and Phillips' boss, Manned Space Flight Administrator George Mueller. When Jimmy Carter won the Democratic nomination for president in 1976, he chose Mondale as his Vice President. The ticket was narrowly elected on November 2, 1976, and Mondale was inaugurated as Vice President of the United States on January 20, 1977. He became the fourth vice president in four years, the other three being: Spiro Agnew (1969–73), Gerald Ford (1973–74), and Nelson Rockefeller (1974–77). Under Carter, Mondale traveled extensively throughout the nation and the world advocating the administration's foreign policy. His travels also included a visit to the USS Midway (CV-41), which was on station at the time in the Indian Ocean, during the Iranian hostage crisis. Mondale was the first vice president to have an office in the White House and established the concept of an "activist Vice President." Mondale established the tradition of weekly lunches with the president, which continues to this day. More importantly, he expanded the vice president's role from that of figurehead to presidential advisor, full-time participant, and troubleshooter for the administration. Subsequent vice presidents have followed this model in the administrations in which they serve. Carter and Walter Mondale are the longest-living post-presidential team in American history. On May 23, 2006, they had been out of office for 9,254 days (25 years, 4 months and 3 days), surpassing the former record established by President John Adams and Vice President Thomas Jefferson, both of whom died on July 4, 1826. On September 8, 2012, Carter surpassed Herbert Hoover as the President with the longest retirement from the office. On April 23, 2014, Mondale surpassed Richard Nixon as the Vice-President with the longest retirement from that office at 12,146 days (33 years, 3 months and 3 days). With George H. W. Bush's death on November 30, 2018, Mondale became the oldest living U.S vice president and Carter the oldest living U.S. president. After losing the 1980 election, Mondale returned briefly to the practice of law at Winston and Strawn, a large Chicago-based law firm, but he intended to return to politics before long. Mondale ran for the Democratic Party presidential nomination in the 1984 election, and was soon the front-runner. His opposition included Reverend Jesse Jackson and Senator Gary Hart from Colorado. Hart won the New Hampshire primary in March, but Mondale had much of the party leadership behind him. To great effect, Mondale used the Wendy's slogan "Where's the beef?" to describe Hart's policies as lacking depth. Jackson, widely regarded as the first serious African-American candidate for president, held on longer, but Mondale gained the nomination with the majority of delegates on the first ballot. At the Democratic Convention, Mondale chose U.S. Representative Geraldine Ferraro from New York as his running mate, making her the first woman nominated for that position by a major party. Aides later said that Mondale was determined to make a historic choice with his vice presidential candidate, having considered San Francisco Mayor Dianne Feinstein (female and Jewish); Los Angeles Mayor Tom Bradley, an African American; and San Antonio Mayor Henry Cisneros, a Mexican American, as other finalists for his running mate. Others preferred Senator Lloyd Bentsen because he would appeal to the Deep South, or even nomination rival Gary Hart. Ferraro, as a Catholic, was criticized by some Catholic Church leaders for being pro-choice. Much more controversy erupted over her changing positions about the release of her husband's tax returns, and her own ethics record in the House. Ferraro was on the defensive throughout much of the campaign, largely negating her breakthrough as the first woman on a major national ticket. She was also the first Italian American to reach that level in American politics. When Mondale made his acceptance speech at the Democratic Convention, he said: "By the end of my first term, I will reduce the Reagan budget deficit by two‑thirds. Let's tell the truth. It must be done, it must be done. Mr. Reagan will raise taxes, and so will I. He will not tell you. I just did." While this was meant to show that Mondale would be honest with voters, it was instead largely interpreted as a campaign pledge to raise taxes to spend on domestic programs, which was unappealing to many voters. Mondale ran a liberal campaign, supporting a nuclear freeze and the Equal Rights Amendment (ERA). He spoke against Reagan's economic policies and in support of reducing federal budget deficits. However, he was running against a popular incumbent and his campaign was widely considered ineffective. Also, he was perceived as supporting the poor at the expense of the middle class. Southern whites and northern blue-collar workers who usually voted Democratic switched their support to Reagan because they credited him with the economic boom and saw him as strong on national security issues. In the first televised debate, Mondale performed unexpectedly well, which led many to question Reagan's age and capacity to endure the grueling demands of the presidency (Reagan was the oldest person to serve as president—73 at the time—while Mondale was 56). In the next debate on October 21, 1984, Reagan deflected the issue by quipping, "I will not make age an issue of this campaign. I am not going to exploit, for political purposes, my opponent's youth and inexperience." In the election, Mondale was defeated in a landslide, winning only the District of Columbia and his home state of Minnesota, and even there his margin of victory was fewer than 3,800 votes, securing only 13 electoral votes to Reagan's 525. The result was the worst electoral college defeat for any Democratic Party candidate in history, and the worst for any major-party candidate since Alf Landon's loss to Franklin D. Roosevelt in 1936. Mondale received 37,577,352 votes—a total of 40.6 percent of the popular vote in the election. Mondale received 40–49 percent in California, Hawaii, Illinois, Iowa, Maryland, Massachusetts, Michigan, Missouri, New York, Ohio, Oregon, Pennsylvania, Rhode Island, Tennessee, Vermont, Washington, West Virginia and Wisconsin. Following the election, Mondale returned to private law practice, with Dorsey & Whitney in Minneapolis in 1987. From 1986 to 1993, Mondale was chairman of the National Democratic Institute for International Affairs. During the presidency of Bill Clinton, he was United States Ambassador to Japan from 1993 to 1996, chaired a bipartisan group to study campaign finance reform, and was Clinton's special envoy to Indonesia in 1998. Until his appointment as U.S. Ambassador to Japan, Mondale was a Distinguished University Fellow in Law and Public Affairs at the Hubert H. Humphrey Institute of Public Affairs at the University of Minnesota. In 1990 Mondale established the Mondale Policy Forum at the Humphrey Institute. The forum has brought together leading scholars and policymakers for annual conferences on domestic and international issues. He also served on nonprofit boards of directors for the Guthrie Theater Foundation, the Mayo Foundation, the National Democratic Institute for International Affairs, the Diogenes Institute of Higher Learning, the Prince Hall Masonic Temple, the RAND Corporation, and the University of Minnesota Foundation. His corporate board memberships included BlackRock Advantage Term Trust and other BlackRock Mutual Funds, Cargill Incorporated, CNA Financial Corporation, the Encyclopædia Britannica, First Financial Fund, and other Prudential Mutual Funds, Northwest Airlines, and United HealthCare Corporation. In 2002, Democratic Senator Paul Wellstone from Minnesota, who was running for reelection, died in a plane crash just 11 days before the November 5 election. At the age of 74, Mondale replaced Wellstone on the ballot, at the urging of Wellstone's relatives. The U.S. Senate seat was the one that Mondale himself had held, before resigning to become Vice President in 1977. During his debate with the Republican nominee, former St. Paul Mayor Norm Coleman, Mondale emphasized his own experience in foreign affairs while painting Coleman as a finger-in-the-wind opportunist. "We have seen you shift around, Norman", Mondale said, alluding to Coleman's past as an anti-war college activist and, more recently, as a Democrat who had changed his party allegiance to the GOP while serving as Mayor of St. Paul. Mondale lost the election, finishing with 1,067,246 votes (47.34%) to Coleman's 1,116,697 (49.53%) out of 2,254,639 votes cast, earning him the unique distinction of having lost a statewide general election in all 50 states as the nominee of a major party (he lost the other 49 in the 1984 presidential election and George McGovern had lost 49 states in the 1972 presidential election and lost the Massachusetts primary in 1984). Upon conceding defeat, Mondale stated: "At the end of what will be my last campaign, I want to say to Minnesota, you always treated me well, you always listened to me." In 2004, Mondale became co-chairman of the Constitution Project's bipartisan Right to Counsel Committee. He endorsed former First Lady of the United States and Senator Hillary Clinton from New York for the presidency of the United States and supported her campaign for the White House in 2008. On June 3, 2008, following the final primary contests, Mondale switched his endorsement to Senator Barack Obama from Illinois, who had clinched the nomination the previous evening, and later won the presidency. Following the U.S. presidential election of 2004 and the mid‑term elections of 2006, Mondale is seen talking with Al Franken about the possibility of the latter running for Norm Coleman's U.S. Senate seat in 2008 in the documentary Al Franken: God Spoke. In the film, Mondale encourages Franken to run, but cautions him, saying that Coleman's allies and the Republican Party were going to look for anything they could use against him. Franken ultimately ran and won the 2008 Senate election by 312 votes after the election results had been contested in court by Coleman until June 30, 2009. Mondale and Senator Amy Klobuchar stood with Franken in the United States Senate chamber when Franken was sworn in on July 7, 2009. Mondale then stood again with Senator Amy Klobuchar when Tina Smith was sworn in on January 3, 2018. Their younger son is William Hall Mondale, former assistant Attorney General of Minnesota (1990–2000). Mondale has deep connections to his ancestral Norway. Upon entering the Senate in 1964, he took over the seat of vice president Hubert Humphrey, another Norwegian-American. In later years, Mondale has served on the executive committee of the Peace Prize Forum, an annual conference co-sponsored by the Norwegian Nobel Institute and five Midwestern colleges of Norwegian heritage. During Norway's Centennial Celebration in 2005, he chaired the committee to promote and develop cultural activities between Norway and Norwegian-American organizations. In the "Walter F. Mondale Papers" at the Minnesota Historical Society, digital content is available for research use. Contents include speech files, handwritten notes, memoranda, annotated briefings, schedules, correspondence, and visual materials. The collection includes senatorial, vice presidential, ambassadorial, political papers and campaign files, and personal papers documenting most aspects of Mondale's 60‑year-long career, including all of his public offices, campaigns, and Democratic Party and other non-official activities. Mondale, Walter F. (1975). The Accountability of Power: Toward a Responsible Presidency. New York: D. McKay Company. ISBN 9780679505587. OCLC 924994584. Mondale, Walter; Hage, Dave (2010). The Good Fight: A Life in Liberal Politics. New York: Scribner. ISBN 9780816691661. OCLC 965579928. Mondale's memoir. ^ Staff Report Archived October 3, 2009, at the Wayback Machine of Church Committee, archived by Federation of American Scientists, retrieved October 22, 2014. ^ "Up Close with Walter Mondale". UNIVERSITY OF MINNESOTA FOUNDATION. University of Minnesota. Archived from the original on November 6, 2015. Retrieved May 2, 2016. ^ "American President: Walter Mondale". Millercenter.org. Archived from the original on July 4, 2013. Retrieved July 20, 2010. ^ Schafer, Ed (February 18, 1977). "Lester Mondale Treasures Privacy". The News and Courier. Charleston, SC. p. 16-A. Retrieved March 21, 2014. ^ "Ancestry of Walter Mondale". Wargs.com. Archived from the original on February 15, 2012. Retrieved February 20, 2012. ^ Hotel Mundal website, Fjaerland. ^ a b "Mondale, Walter Frederick, (1928 – )". Biographical Directory of the United States Congress. Retrieved August 11, 2011. ^ "Mondale Future". The Washington Post. January 20, 1977. ^ Mondale, Walter (2010). The Good Fight: A Life in Liberal Politics. Simon and Schuster. ISBN 9781439171684. ^ "Walter F. Mondale : mnhs.org". mnhs.org. ^ Burke, Kevin S. "Happy anniversary, Clarence Gideon". MinnPost. ^ Cohn, Victor (1976). Sister Kenny: The Woman Who Challenged the Doctors. University of Minnesota Press. p. 244. ISBN 9780816657339. ^ Olson, Dan. "The Mondale Lectures: Atlantic City Revisited". Minnesota Public Radio. ^ Lin, Judy (October 7, 2010). "George McGovern: the personal and political toll of mental illness". UCLA Today. Archived from the original on December 11, 2012. Retrieved September 6, 2012. Six colleagues – from Ted Kennedy to Walter Mondale – turned him down for reasons ranging from "My mother just couldn't take it" (Kennedy, referring to Rose Kennedy's grief following the assassinations of her sons, John and Robert) to "I'm getting married tomorrow, and I don't know if my marriage will survive a presidential campaign" (Abe Ribicoff). ^ "Can a Catholic be a Democrat?". google.com. ^ "American President: A Reference Resource". Miller Center of Public Affairs. Archived from the original on March 19, 2015. Retrieved June 16, 2015. ^ a b c "Washington Goes to the Moon (Part 2)". Soundprint. Washington D.C. May 24, 2001. NPR. WAMU 88.5 FM. Archived from the original on July 28, 2011. yes. Retrieved March 15, 2011. ^ Anderson, Clinton P.; Edward M. Brooke; Charles H. Percy; Walter F. Mondale (January 30, 1968). "Apollo 204 Accident". Senate Report. Washington, D.C.: U.S. Senate. No. 956. Archived from the original on December 20, 2014. ^ Trying to Win the Peace, by Even Thomas, Time. ^ "1984 Presidential Election Data—Minnesota". Archived from the original on July 11, 2001. Retrieved April 5, 2006. ^ "Mondale Concedes to Coleman". Fox News. ^ "Senate recount trial: Judges' ruling is boon to Franken". Star Tribune. ^ "Kara Kennedy, Eleanor Mondale dead at 51". Chicago Tribune. Archived from the original on September 18, 2011. Retrieved September 17, 2011. ^ "Biography of Walter F. Mondale:". mnc.net. ^ "Walter Mondale to be new Consul General in Minneapolis". Government.no. ^ "Finding Aid: Walter F. Mondale Papers". United States Congress. "Walter Mondale (id: M000851)". Biographical Directory of the United States Congress.